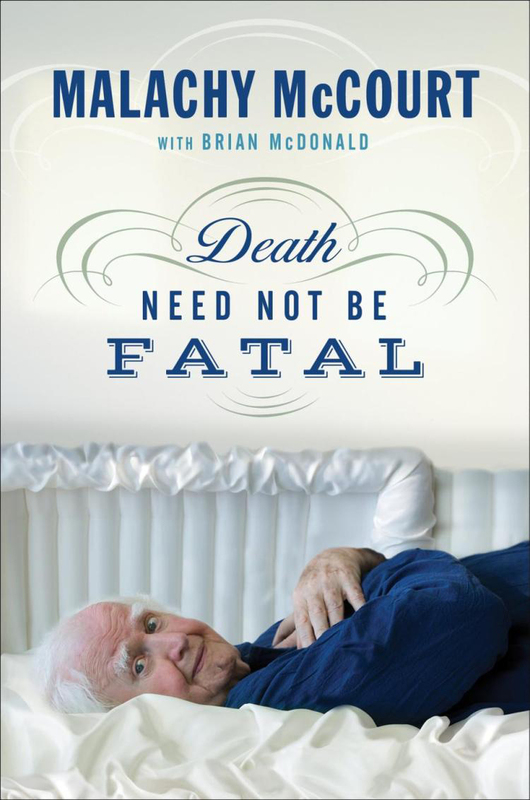 There is something fitting about where Malachy McCourt is calling from as I speak to him about his dark and hilarious new book Death Need Not Be Fatal. McCourt is at a Manhattan rehabilitation facility, where he will spend the next few weeks recovering from a “severe attack” of gout. “I’m doing pretty good now,” he says, sounding lively and cheerful enough given what he’s endured. For the next few weeks, as he recovers, McCourt will spend his days moving around very carefully and doing light rehabilitative exercises. “All the things little babies love to do,” he says with a laugh. In September, McCourt turns 86. He is the last living child born to that resilient literary heroine Angela McCourt. His now-famous youth – in Brooklyn as well as Ireland – was scarred by poverty and death. His adult years brought some material comforts, thanks to numerous books, and acting roles on the stage and screen. But friends and family, including beloved brothers Alphie, Mike, and of course Frank, are passing at a ferocious rate. So perhaps it’s no surprise that McCourt would write a book not only about death, but that essentially taunts the Grim Reaper with a very powerful and very Irish weapon – humor. McCourt credits a chat with New York Irish American author Brian McDonald (My Father’s Gun, Last Call at Elaine’s) for inspiring Death Need Not be Fatal and helping to shepherd it into print. McDonald, credited as co-author, ended up listening to and organizing various thoughts McCourt had written, ultimately getting the words onto the pages. “I don’t type,” McCourt says bluntly. “We’re the only race that celebrates the wake and mourns the marriage,” Malachy says. In the decades that followed, Malachy ran bars, acted in movies from The Molly Maguires to She’s the One, in soap operas such as Ryan’s Hope, and wrote a play with his brother called A Couple of Blaguards, which is still being produced. His memoirs A Monk Swimming and Singing My Him Song were best sellers. McCourt still writes every day, when he’s not strolling in the park or meditating with his beloved wife Diana, whom he’s known for over 50 years now. These days, McCourt finds himself missing the sense of humor he and his brothers all shared. But he still loves spending time with his four children, as well as his grandchildren. That is what he is most looking forward to when he completes his recovery from gout. N.B. McCourt was awarded the inaugural Origin in Bloom Literary Award at the theater company’s annual Bloomsday Breakfast at Bloom’s Tavern in New York City. “There is no better champion for artists, the arts, the little guy, and the big-hearted than our dear friend, Malachy McCourt,” Heslin said. “That is why this award is so meaningful to us. Though he always brushes these kinds of things off, Malachy deserves our undying love for all that he does.” Bloomsday is celebrated in honor of James Joyceʼs landmark novel Ulysses, which follows the day-long wanderings of Leopold Bloom through Dublin on, June 16, 1904.